Apolipoprotein E, a component of the plasma lipoproteins, plays an important role in the transport and metabolism of cholesterol and other lipids. Three single nucleotide polymorphisms (SNPs) -491A>T, -219T>G and +113G>C in the regulatory region of human apolipoprotein E gene (APOE) change the promoter activity and are associated with a wide variety of disorders including Alzheimer disease (AD). Functional SNPs in porcine APOE gene 5' regulatory region have not been explored. We examined SNPs within this region (from -831 to +855), and the analysis revealed that the T>A SNP at position -155 among these three polymorphism sites (-440, -155, +501) was found to exert a marked influence on the transcription of the porcine APOE gene. Electrophoretic mobility shift assays showed that the binding affinity of oligonucletides containing the -155A to transcription factor(s) was stronger than that of the -155T. Transient transfection assays and quantitative real-time PCR results revealed that the -155T>A variant enhanced the activity of the APOE promoter and was associated with increased APOE mRNA levels in vivo. These data suggest that the -155T>A mutation in the promoter region of the porcine APOE gene is an important functional variant. The results provided new insights into aspects of pig genetics and might also facilitate the application of pigs in biomedical studies addressing important human diseases. Apolipoprotein E (apoE = protein; APOE = gene) is a component of lipoproteins, and thereby regulates lipoprotein metabolism; apoE also plays a key role in maintaining neuronal integrity [1–4]. Utermann et al. were the first to identify three isoforms of human apoE, named E2, E3, and E4. The allele encoding apoE4 is a risk factor for atherosclerosis [6, 7], and AD [1, 8, 9]. In addition, humans with E4 allele responded to a lipid-lowering therapy poorly whereas those with E2 allele sensitively . There are four single nucleotide polymorphisms (SNPs) at -491, -427, -219 and +113 in human APOE promoter [11–13]. The base substitutions at -491A>T and -219T>G were found to alter promoter activity and transcription factor binding affinity [12, 14, 15]. The -491SNP and -219SNP were related to different plasma apoE , LDL and cholesterol concentrations , and the risks of atherosclerosis  and AD [14, 15]. Furthermore, +113SNP modulated lipid, lipoprotein concentrations and aortic atherosclerosis [11, 13]. However, there were inconsistent reports about APOE polymorphisms and coronary heart disease  or AD [19–21]. In pigs, APOE has been mapped to chromosome 6 [22, 23]. Porcine APOE is 4267 nucleotides in length, comprising of four exons and three introns, and a (CG)13 microsatellite located within intron 3 . Additionally, Brzozoeska et al. studied the cDNA sequence of porcine APOE, and Kurył  described three isoforms of porcine apoE. Fan et al. recently demonstrated that a SNP within intron 2 of porcine APOE was associated with body conformation traits. However, the functional SNPs in the 5' regulatory region of porcine APOE remain unclear. To identify the functional SNPs in the 5' regulatory region of porcine APOE, mRNA expression levels and promoter activities associated with different genotypes were analyzed with quantitative RT-PCR (qRT-PCR) and transient transfection assays respectively, potential cis-acting elements surrounding the SNP were examined with electrophoretic mobility shift assays (EMSAs). Our results indicate that the -155 SNP modulates the expression level of porcine APOE. Three overlapping fragments from -831 to +855 (1686 bp) were amplified. Three SNPs were identified in this region: -155T>A, -440G>A, and +501A>T. The genotypic frequencies of -155SNP were listed in Table 1. The frequencies were highly significant among different genotypes within the breeds (P < 0.01), but not significantly different (P > 0.05) between the breeds. Genotype frequencies of the porcine APOE -155 SNP in different populations. The three polymorphic sites were examined with MatInspector http://www.genomatix.de . Results revealed that the mutation -155 T>A lost the transcription factor sites for GAGA, KLF6, PURα, KKLF, cKROX and MAZ, and gained sites for BKLF and CTCF (additional file 1), while the other two (-440G>A, and +501A>T) did not show changes (data not shown). We aligned porcine and human APOE promoter sequences. The homology of the proximal promoter regions between human APOE from -236 to +10 and porcine APOE from -265 to -12 was of greater similarity (69.1%) than those of -266 or more upstream of porcine APOE, and a TATA box was found in the two sequences (Figure 1), which suggested functional importance of these fragments across the two species. There is a functional mutation -219T>G in human APOE , and the -155T>A of porcine APOE changes the potential transcription factor binding sites (additional file 1). Thus -155T>A mutation was further studied. Homology of human APOE and porcine APOE promoter. The porcine promoter sequence (225 bp) (U70240.1) was aligned with the proximal-most 245 bp of human APOE sequence (AF261279). The similarity is 69.1%. Positions of the "TATA" box and the -155SNP site are indicated. To determine whether -155T>A was associated with differential APOE expression in vivo, hepatic mRNA levels of adult Dahuabai pigs were analyzed with qRT-PCR. The results revealed that mRNA levels of -155AA animals were approximately 11 times higher than those of -155TT animals (Figure 2). The T>A transition at position -155 in the porcine APOE promoter region increases mRNA levels in Dahuabai pigs. Data are expressed as means ± S.E.. The mRNA levels of different genotypes differ P < 0.01. We used the porcine APOE promoter region spanning -268 to -11 to assemble fusion constructs of the APOE promoter and a firefly luciferase reporter. As shown in Figure 3, the promoter with -155A allele was significantly better at driving luciferase expression, and reporter levels were 6.7-time higher than that with -155T. Functional analysis of porcine APOE promoter alleles containing -155T or A. Data are expressed as means ± S.E.. The activity of the -155A promoter is significantly (P < 0.01) higher than that of -155T. EMSAs were performed to understand whether the differential promoter activities were related to changes in protein binding. As shown in Figure 4, incubation of nuclear extract with the probe corresponding to the -155T or -155A allele predominantly formed a specific binding complex (lane 2 of Figure 4A and 4B, arrowed). The binding complex of -155T probe with transcriptional factor(s) was largely abolished by co-incubation with an excess of either unlabelled -155T or -155A allele probes (lanes 3-6 of Figure 4A). By contrast, the complex formed by incubation of nuclear extract with the -155A probe was largely eliminated by co-incubation with unlabelled -155A competitor (lanes 3, 4 of Figure 4B) or unlabelled 50-fold excess -155T probe (lane 6 of Figure 4B), whereas a conspicuous complex formation was observed in the presence of unlabelled 10-fold excess -155T competitor (lanes 5 of Figure 4B). The results indicated that -155A allele can greatly enhance the binding affinity of transcriptional factor(s). The T>A transition at position -155 of the porcine APOE gene increases DNA-binding affinity of nuclear protein(s) in porcine fetal fibroblasts. Electrophoretic mobility shift assays were carried out as described in Materials and Methods. Protein-DNA complexes were separated on 5% PAGE and exposed to X-ray film. In competition experiments (lanes 3-6), Nuclear extracts were preincubated in the absence (-) or 10-fold excess (+) or 50-fold excess (++) of unlablled competitor before addition of the 32P-labelled probe. Binding complexes identified with the -155T probe and -155A probe were indicated with arrows. This study identified a functional SNP in the 5' regulatory region of porcine APOE. The behaviours of the allelic forms of the reporter gene expression, real-time PCR and EMSA in our study strongly suggested that -155T>A allelic differences of the APOE transcription may be a consequence of differential binding ability of transcriptional factors or differential transcriptional factors bound to a wild type or a mutation type present in cells. To distinguish potentially functional SNPs from nonfunctional SNPs, we focused on cis-acting elements based on the suggestion of Knight  and used a predictive program http://www.genomatix.de . The results indicated there were different transcription factors binding the cis-acting elements surrounding the -155SNP (additional file 1). The -155T contains a CCCTCCC motif that is known as the SP1 binding site , and SP1 has been implicated for its function in regulating AD-associated genes . Meanwhile, the mutation at porcine APOE -155 site still had SP1 binding ability. 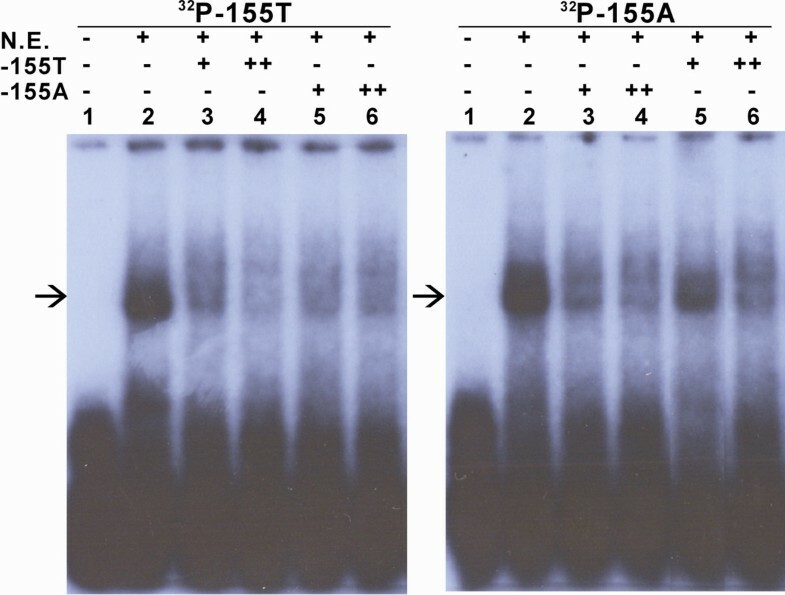 The existence of multiple transcription factors binding the -155 region was further reinforced by incubation of a -155T/A DNA probe with nuclear extracts from porcine fetal fibroblasts forming DNA-protein complexes as demonstrated by EMSA. Importantly, competition EMSA using excess unlabelled probes revealed a difference in the binding affinities of promoter alleles: excess -155A DNA cold probe effectively abolished complex formation, whereas 10-fold excess -155T DNA cold probe failed to prevent labelled -155A probe-protein complex formation. From the above results, we could consider that the -155A promoter had a significantly higher affinity for binding factors than that for the -155T promoter. Interestingly, for human APOE -491A>T mutation, the -491A displayed an increased affinity for human hepatic nuclear proteins , while the -491A showed an opposite trend for rat pheochromocytoma and human SK-N-SH neuroblastoma nuclear proteins . It was demonstrated, in transfected cells, that the cloned promoter containing the -155A variant was significantly stronger than that of the corresponding -155T variant at driving luciferase expression (6.7-fold higher expression, P < 0.01). The cloned promoter in this research did not contain either of the other two identified polymorphic sites (-440 and +501). The difference in transcription efficiency was confirmed in vivo, and APOE mRNA levels were 11 times higher in liver tissue from -155AA homozygous pigs than that in the tissue from -155TT homozygotes (P < 0.01). In the report of Maloney et al. , human -491A>T variant interacted with -219G>T because both mutations altered the variety and binding affinity of transcription factors. However, the -401SNP and +501SNP in porcine APOE were not expected to change the transcription factors, which implied that there may be no interactive effect between porcine APOE -155SNP and the other two SNPs. All these data suggest that polymorphism at SNP-155 modulates transcription of the porcine APOE gene by affecting the ability of the APOE promoter to bind to trans-acting factors. It is notable that the -155 T>A substitution alters the CCCTCCC sequence to CCCACCC. The CACCC box is a well-described cis-acting transcription element that can serve as a binding site for widely distributed transcription-activating factors that act collaboratively with other regulatory proteins . There are a larger family of zinc finger transcription factors bound to CACCC box . Mutation of this box is thought to change binding and transactivation by transcription factors and therefore to decrease transcription levels [33–36]. Our results suggest that the -155A allele is associated with increased levels of APOE transcription in vivo. It seems probable that the -155A variant can elevate levels of apoE protein. We also report that the frequency of the -155AA genotypes is significantly under-represented, compared to -155TT and -155TA, in each of the four different pig populations analyzed. Although the explanation for this depletion is unknown, there are several considerations as follows. Firstly, it was previously reported that apoE enhanced cell lipid homeostasis [17, 37] and could reduce the risk of heart disease [16, 38]. In humans, the concentration of apoE in plasma or brain varies according to APOE genotype in the order E2 > E3 > E4 , and the E4 allele is an established risk factor for AD. The -491A allele of human APOE is also a risk factor for AD, but this function is associated with higher levels of APOE transcription versus the -491T allele, and these effects are exerted independently of E4 . In the experiments reported here we found that the -155A allele was associated with significantly increased transcription of porcine APOE both in transfected cells and hepatic tissue. Higher apoE concentration lead to increased cytotoxicity , thus -155A allele may be harmful to porcine survival. Secondly, some recessive genes that terminate fetal development are known to be located on swine chromosome SSC6 between SW855 and SW122 , a region that includes the porcine APOE gene [22, 40]. The affected gene(s) in the homozygous state can prevent embryo development after 9 days post-coitus when the spherical embryo grows to the filamentous form, leading to embryonic death due to implantation failure . This suggests that under-representation of -155AA could be a consequence of linkage disequilibrium between porcine APOE and other genes in the vicinity. We have identified a functional SNP in the regulatory region of the porcine APOE gene that was associated with altered interactions with DNA-binding factors, marked differences in the activity of the APOE promoter and levels of APOE mRNA in vivo. All animal procedures were performed according to protocols approved by the Biological Studies Animal Care and Use Committee of Guangdong Province, China. Ear tissues of Landrace, Yorkshire, Chinese indigenous breed Lantang and Dahuabai pigs were used for genomic DNA isolation according to Sambrook and Russell . Primers (Table 2) for three overlapping segments were designed with Primer Primer 5.0 according to porcine APOE sequence (GenBank: U70240.1). The PCR products were sequenced and genotyped. Total RNA was extracted from the hepatic tissue of adult Dahuabai pig (-155TT, -155TA, -155AA, 6 animals of each of the three genotypes) with TRIzol reagent (Invitrogen). QRT-PCR analysis was performed using the ABI 7500 system (Applied Biosystems) (primers: 5'-CGCAGGATGCCGGACAGA-3' and 5'-CCTCCTGCACTTGGTCAGACA-3'). 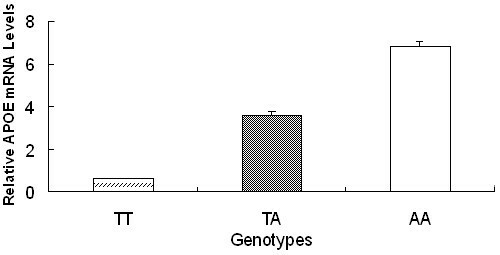 The gene expression levels were qualified relative to the expression of β-actin by the comparative CT method . 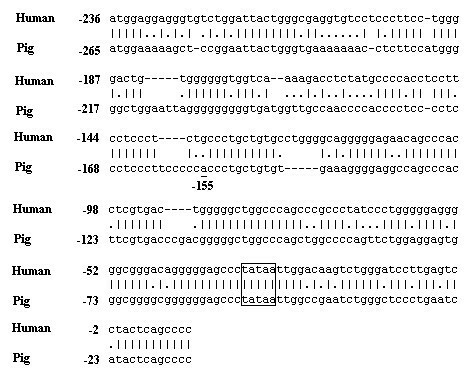 The DNA segment spanning the -268 to -11 region of porcine APOE and containing either the -155T or -155A variants was amplified with the primers 5'- CACGCGT AGTGGCATGGAGAAA-3' and 5'- ACTCGAG ACTCCTCCAGAACT -3', thereby creating the restriction sites of Mlu I and Xho I (underlined). Following restriction enzyme digestion the PCR products were inserted to vector pGL3-basic (Promega). The integrity of cloned sequences was confirmed by sequencing. Porcine fetal fibroblast cell line was established as described previously . Cells (1.5 × 106 per well) were seeded into 96-well plates and grown to 80-90% confluence, and transfected with APOE promoter/firefly luciferase reporter plasmids by Lipofectamine 2000 transfection reagent (Invitrogen). To control for transfection efficiency, cells were co-transfected with 2 ng of Renilla luciferase reporter plasmid (Promega). After 48 h of transfection, cells were lysed and assayed for promoter activity using the dual luciferase reporter assay system. Firefly luciferase activity was expressed relative to Renilla luciferase activity. Nuclear proteins were extracted from porcine fetal fibroblast cells cultured at third passage (Nuclear Extract Kit, Active Motif). The sequences used for EMSAs were 5'-CCCCTCCCCC(T / A ) CCCTGCTGTGTG-3' surrounding the -155 site. The oligonucleotides were 5'-labeled with [γ-32P]-ATP using a Megalabel DNA 5'-labelling Kit according to the specifications of the manufacturer (Takara). The 5'-labelled probes used in subsequent experiments were double stranded. The binding mixture included 0.5 μg poly (dI-dC) (Amersham Biosciences), 2 μl of 5 × gel-shift binding buffer, 2 μg of nuclear extract. The mixture was maintained at room temperature for 10 min, 2 μl of radiolabelled oligonucleotide probe was added, and incubation was kept for a further 20 min at room temperature in the presence or absence of a 10- to 50-fold molar excess of unlabelled probes. DNA-protein complexes were fractionated by electrophoresis on 5% non-denaturating polyacrylamide gels. For continuous data, comparisons of two means employed independent t tests, q values were calculated for comparisons of three means. Genotype frequencies were analyzed with probit models . Shixin Li, Hao Zhang contributed equally to this work. We wish to thank Changli Wu and Liangliang Wang for their help in PCR and animal genotyping. The Work was supported by National Science Foundation of China (30771545, 30871781), the 863 Project of China (2007AA10Z161, 2008AA10Z135) and the earmarked fund for Modern Agro-industry Technology Research System (CARS-36). SL conceived and designed the study, performed the EMSAs, designed PCR primers and wrote the paper. HZ designed the study, performed the qRT-PCR, and genotyped the animals, analyzed the data and wrote the paper. PG cultured porcine fetal fibroblast cells, constructed the plasmids and performed transient transfection assays. ZC extracted DNA and RNA, and performed animal genotyping. CW extracted DNA and RNA, and performed qRT-PCR experiments. JL designed the study, supervised the experiments and wrote the paper. All authors read and approved the final manuscript.